Creating turnout that encourages horses to move facilitates physical and mental wellbeing, writes Jill Willis. 'Paddock Paradise' is both a term and a concept used to describe a natural and humane way to keep healthy, happy horses based upon the lives of the wild, free roaming horses in the US Great Basin. Introduced by veteran hoof care professional and natural horse care advocate Jamie Jackson in his 2006 book ‘Paddock Paradise: A Guide to Natural Horse Boarding,’ the premise of a natural boarding model is to provide safe, humane, living conditions which use the horse's natural instincts to stimulate and facilitate movement and other behaviours that are essential to a mentally and physically sound horse. Based upon a four year study of the natural behaviour of wild horses, the theory originally proposed that horses - like any other species - will thrive physically, mentally and emotionally if kept in an environment that takes into consideration the most basic elements of a horse’s natural habitat. According to Jackson, who founded the Association for the Advancement of Natural Horse Care Practices (AANHCP) in 2002, the health of the horse shows up in their hooves. 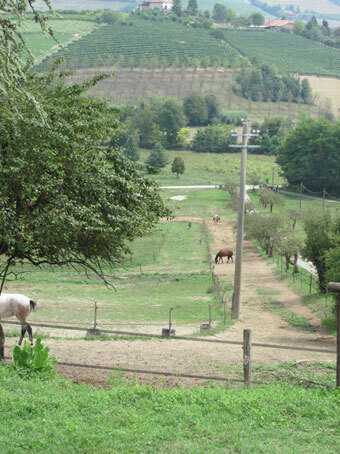 The creation of an environment that simulates a horse’s natural habitat can restore natural integrity and soundness. This includes lots of movement and a reasonably natural diet with free access to a variety of low sugar / low carb grass hays. In the wild, horses are observed moving along familiar tracks as they travel great distances to different places in their various territories. Because horses are animals of prey, they instinctively move in a close, single file formation across these home ranges as they seek out forage, water, rolling spots and other activities essential to their biology and survival. In a natural horse boarding model, tracks are created to stimulate natural movement. Horses quickly reveal their desire to use these tracks by creating narrow, worn down paths just like in wild horse country where travel (or forward movement) is the sole purpose or activity. Natural horse boarding is unlike a traditional horse keeping situation with stables, small paddocks and / or lush green pastures. It is designed to meet the basic needs of the species as social, nomadic animals of prey whose basic biology require that they have access to the right sorts of forage 24 hours per day. A Paddock Paradise also facilitates other natural behaviours such as herd hierarchy (pecking order), mutual grooming, playing, resting and sleeping behaviours. Facilitating Health The principal goal of a Paddock Paradise is to facilitate health and soundness - both physical and mental - in the horse. In fact, it is an ideal preventative to many of the illnesses and disorders plaguing domestic equines who are forced to live in stalls or other forms of close confinement or, equally hazardous, in lush, sugar-laden grass pastures. In fact, Jackson believes that a genuine Paddock Paradise can virtually eliminate the risk of laminitis, colic, Navicular Syndrome, Cushings Disease and other debilitating conditions caused by an unnatural lifestyle of confinement, isolation and/or being provide the wrong diet. A Paddock Paradise will also encourage movement even on small acreages. It allows horses to live more closely to the manner nature intended, moving freely 24/7 and eating in a more natural way by having constant access to the right kinds of food placed strategically throughout their track. When horses are allowed to live in a manner that more closely resembles their natural habitat, not only are they healthier but happier. Creating a Paddock Paradise Creating a Paddock Paradise can be fairly simple and inexpensive. An electric fence ‘loop’ can be installed inside a perimeter fence and surround a pasture or field to create a series of tracks. Along these tracks you need to place a various stimuli such as strategically placed feeding spots and watering holes to activate curiosity and movement. Many people will begin with plastic electric fence posts. This will allow you to find out what formation or configuration will work best before the time and energy is put into creating a more permanent interior fence. Electric fencing manufacturers offer a variety of solar chargers that can be used if electricity is not readily available, although this may not be suitable in those areas where the sun disappears for months at a time. You can use the centre field or pasture to grow hay now that the horses are no longer accessing the area. Ideally, horses living on track will not be shod so that the nails do not become a hazard when the shoes are lost. The increased movement, preferably on dry tracks that have added gravel and rock, will help condition and callus the hooves so that shoes are no longer needed. Hay should be scattered in numerous areas on the track that are specifically enlarged and suited for feeding areas. The hay can be fed from the ground or from a variety of feeding containment systems – from small hole hay nets to plastic tubs with proper drainage – placed strategically in a number of different areas so that the horses are not encouraged to stand in one place for long periods of time to eat. It may take some horses six months or longer before their bodies will become accustomed to ad lib hay, especially if they have been on restricted diets in the past. Horses secrete hydrochloric acid continuously and if there is nothing in their digestive system for the acid to break down ulcers can occur. Horses living in a genuine Paddock Paradise no longer have these issues but it can sometimes take a bit of time before they seem to trust that they will not be returned to this former way of life. Shelter from harsh weather should always be provided along the track so that horses have a way to escape severe wet and cold conditions and the sun. The Official Guide ‘Paddock Paradise: A Guide to Natural Horse Boarding’ was written by Jamie Jackson and first published in 2006. For more visit www.paddockparadise.com or search Paddock Paradise on Facebook. The book is available at most online book retailers. The photos featured here are from the headquarters of the Association for the Advancement of Natural Horse Care Practices in Lompoc, CA (www.aanhcp.net). UK based Paddock Paradise consultant Nick Hill is based in the Highlands of Scotland but travels extensively throughout the UK. Visit www.cloverroseequine.co.uk for more details or call 01808 52175101808 521751.